The Jaguars did more than hire Doug Marrone and Tom Coughlin on Monday. They also doubled down on Blake Bortles. When grades are assigned for the 2016 crop of coaching hires, no one’s giving Jacksonville an “A,” not for elevating a coach whose career record remains under .500, not when that coach led the deficient offensive line of a 3-13 team for most of last year, and not when the makeup of the football operation looks similar (outside of one promotion and the return of an ex-employee in a senior advisory role). The Jags know they aren’t winning those sorts of battles here. They know that if they get the quarterback many thought they reached on three years ago, it won’t matter. And they know if Bortles doesn’t get better, then they’ll all be gone. So the central question in all of this: Is Bortles actually fixable? 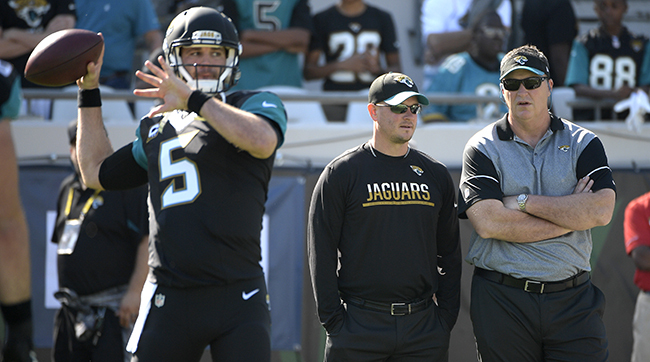 Marrone (right) oversaw two strong games from Bortles. Between his first and second seasons, Bortles completely overhauled his mechanics, and man did it work. He threw for 4,428 yards, 35 TDs and 18 picks in 2015, and improved his passer rating by nearly 20 points. Perhaps believing the changes had taken hold, and were thus permanent, Bortles wasn’t as diligent in drilling fundamentals last offseason. And that showed too. His passing yards, TD/INT ratio, and passer rating were all down significantly, and Bortles failed the eye test even more miserably. It was so bad that the young quarterback’s presence was a deterrent for some coaching candidates. David Caldwell said less than a month ago, after Gus Bradley was fired, that there would be no mandate that the next coach start Bortles, but tipped his hand in saying he still believed “very much” in the young quarterback. The truth is, Jacksonville wasn’t going to hire someone who thinks Bortles is broken. Of course, an ability to turn Bortles around wasn’t the only factor here. The Jags, from the start, wanted someone with head coaching experience, believing their young team—which couldn’t handle the freedom of Gus Bradley’s program—could use a grown up in the room (part of why Mike Smith also appealed to them). On top of that they wanted alignment, which is where Marrone’s connections to Bill Parcells (Coughlin’s old boss) and Bill Polian (Caldwell’s old boss) come in. But beyond that, they wanted to find a way to get Bortles right. That’s why it is not insignificant that Bortles had his two strongest outings of the year in Marrone’s two games as interim coach, throwing for 325 yards a 103.5 rating in the first game, and 301 yards and a 96.2 rating in the second. Nor is it a mistake that Caldwell and Marrone are now signed through 2019, which means decision time will come the year before, which happens to be Bortles’ walk year. So we’ll see what happens. If Bortles proves 2016 was a bump in the road (his struggles led to the firings of Bradley and Greg Olson, and authority over the 53-man roster being passed from Caldwell to Coughlin) in his maturation as a quarterback, and starts fulfilling his considerable potential, then it won’t matter whether or not this all looked so uninspired in January 2017. If it goes the other way, then… well, we’ll all be right back here again in a couple years wondering where Jacksonville turns next. Buffalo: For some time, all signs have pointed to interim coach Anthony Lynn being promoted, with Gus Bradley a candidate to come in as his defensive coordinator. But the further this process drags out—with candidates like Sean McDermott, Kris Richard, Teryl Austin and Harold Goodwin having interviewed—the less of a shoo-in Lynn seems to be. The Pegulas are at least trying to look open-minded about it. I wouldn’t be surprised if McDermott winds up making the call tough on the owners, though the idea of another shotgun marriage of GM and coach could deter them. Denver: John Elway interviewed Vance Joseph in 2015, and wanted to hire him as Gary Kubiak’s DC before “settling” for Wade Phillips (the Bengals blocked Joseph). Joseph went to Miami to run the Dolphins’ D a year later, and now looks to be the front-runner here. Word’s been out for a while, too, that he’d think about bringing ex-Charger coach Mike McCoy—who’s familiar with Denver—with him as OC. Los Angeles: This is the most wide-open search, and my sense is that their focus on assistants is because they’d like to “discover” their own guy. That’s why 30-year-old Redskins offensive coordinator Sean McVay makes the most sense here. The fate of GM Les Snead—who’s been in the interview room along with COO Kevin Demoff and senior assistant Tony Pastoors—would be another piece that needs to fall into place. San Diego: The Chargers’ focus remains on a handful of defensive and special teams coaches who could work with sitting offensive coordinator Ken Whisenhunt and his staff. And San Diego’s analytical work shows previous head coaching experience to be a big plus. Given that criteria, it seems as if Mike Smith—the runner-up for the Jacksonville job—is the best fit as it stands today. San Francisco: Josh McDaniels has had the inside track, and my understanding is that he preferred the Niners’ situation to the other two he interviewed for, because this is a from-the-ground-up situation. No bad contracts, pick your own QB, high draft picks… it’s basically like an expansion team. And there’ll be a new GM coming with you, too. If McDaniels gets the job, it could be Lou Riddick filling that role.